An ATM was found abandoned after an explosion at a post office early this morning. 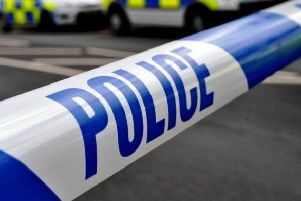 Police were called at 4.40am on today after a report that the post office had been broken into, a spokesperson for Sussex Police said. On arrival at the store in Mansell Road, Shoreham, officers found the front door of the shop had been smashed and significant damage had been caused to the ATM within the shop. There was a considerable amount of cash dropped at the scene. A cash draw from the ATM machine was found abandoned a short distance away. Detective Sergeant Del Thurgood said: “It is believed the explosion was caused by gas being forced into the front of the ATM machine before being ignited. This was an extremely dangerous incident which could of caused serious injury to the offenders and members of the public. Fortunately there were no reported injuries. At this stage it is not known how much cash had been in the machine, police say. Enquiries are at an early stage and anyone who saw what happened or who has any other information is asked to contact Sussex Police via 101@sussex.pnn.police.uk quoting serial 168 of 03/03. Members of the public can also report online to https://sussex.police.uk/contact-us/response-to-appeal/ or call 101.